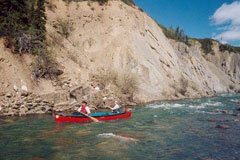 The Snake River has fast flowing whitewater and we will encounter rapids up to Class III. This river is located along the Yukon. N.W.T border. As the Snake River begins above tree line, the terrain offers superb hiking and spectacular views. Day 1: You will be picked up from the airport and brought into Whitehorse to do any last errands. Then we drive toward Mayo and camp along the way. Day 2: We arrive in Mayo and fly 240 km by floatplane to Duo Lakes. From here we portage 1.5 km to the Snake River. Day 3: Today is our first day of paddling, and we will paddle fast water, past canyons, around tight corners and through small rapids. We camp at Reptile Creek. Day 4: We continue paddling fast water and some Class II, passing canyons and opening the view to the Bonnet Plume Range. 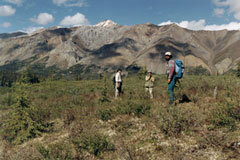 It is likely that we will see some dall sheep and caribou. At our campsite this evening we can eat our dinner enjoying the panorama of Mount MacDonald. Day 5: Today we leave our canoes and hike Mt. MacDonald. As this hike takes us up 600 meters in elevation, and we are granted stunning views of the Snake River Valley. Day 6: We will be paddling a fast ‘slalom course’ today. Afterwards, we paddle a picturesque canyon void of obstacles. Day 7: The river is quick today with high waves and rocks as it flows through many valleys. Day 8: Today we have the opportunity to take another hike. However, if hiking doesn’t suit you, relaxing by the river is also an option. Day 9: We near a deep canyon that we will portage, as we paddle today. Thankfully the trail is good. Later on we navigate standing waves and rocks. Day 10: We notice a change in the landscape, as we paddle today. The river takes us out of the high mountains and down to where the Snake River branches. We will paddle through small canyons. Day 11: The branches of the previous day meet again and the Snake River’s flow begins to ease up a bit. The majority of what we paddle by today are steep slopes and small tributaries. In this area you typically see many peregrine falcons. Day 12: Today we reach the large and fast flowing Peel River. We build our camp on the Taku Bar. Day 13: This afternoon we will be picked up by an Otter floatplane and flown back 320 km to Mayo. We will overnight at the campground. Day 14: We drive 410 miles from Mayo to Whitehorse. We finish our tour together over a restaurant dinner before your last night at the hotel or campground. Prerequisites: This tour is only suitable for people with white water canoeing experience. Good physical fitness is required for mountain hikes and portages.